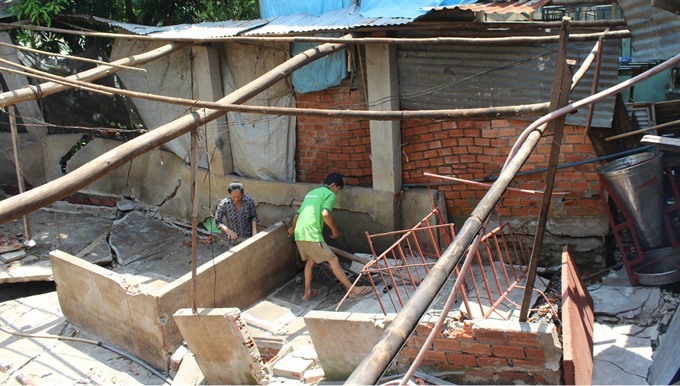 HCM CITY – Increased awareness of the negative impacts of sand mining has sparked public outrage of late, but it has proceeded apace. The uncontrolled exploitation of sand has harmed the environment badly, hurt the structure and safety of waterway transport, caused land erosion and altered the flow of water. However, it seems that high profits have blinded illegal sand miners to the havoc they are causing, including the collapse of houses on river banks. Reporters from the An ninh Thế giới ( World Security) newspaper recently toured the Sài Gòn River to take a closer look at sand exploitation. Ba, an elderly fisherman, told them that the river water has turned murky and black compared to a decade ago, when it flowed smoothly and was full of fish and shrimp. About 200m from the Bình Phước Bridge, several houses are now unstable because land erosion is eating into their foundations. One cement road has been washed away, and several houses stand abandoned in the middle of sand dunes. River water has eroded a road in District 12’s An Phú Đông Ward, despite efforts from local residents who’d tried to fight erosion by staking piles of wood. At the end of last year, ornamental tree growers in Hiệp Bình Phước Ward suffered serious losses when an embankment collapsed. One elderly man said: “It is said that the river is increasingly aggressive because of many factors, like tide, flow, geological conditions and illegal sand mining. “But local long time residents are sure that illegal sand mining is the main reason,” he said. N.V. Hùng, a resident of Long Phước Ward, District 9, said dozens of hectares of cultivation land have been destroyed. From the Bình Phước Bridge, the reporters could see that three sand mining areas were operating around the clock. Some boats of the illegal sand miners hidden under big trees were using suction pipes. Sand-carrying trucks were constantly coming in and out of the area and the flying dust looked very harmful to residents’ health. An official of An Phú Đông Ward said they were aware of the situation and asked District 12 police and transportation inspectors to tackle overloaded trucks. But two sand gathering areas had licences so it was difficult to stop their operations, he said. In Long Bình and Long Phước areas in District 9, seen as site with great potential because of the quality of sand, authorities say 40 hectares of land have been washed away by river erosion. Residents who’ve lost land have called on the police force and local authorities to help. Of late, the Ministry of Public Security’s waterway police force No 3 has set up examination points in District 9, and co-ordinated with border security forces to fight the illegal sand miners. Their efforts seem to have borne some fruit. A local resident, Nguyễn Văn Thông, said that with stricter police inspections the situation had improved. However, Thông also said he was afraid that the high profits are likely to motivate the sand miners to return after a break, when authorities loosen their inspection regime. The Cát Lái police station and waterway police force No 3 are jointly managing a 30km-long section of Sài Gòn River from the Đèn Đỏ T-junction to Đồng Nai. During a crackdown against the illegal sand exploiters last month, the culprits were reckless enough to fight the police force, dumping large amounts of sand on to the police boat trying to sink it. The police had to seek urgent help from the team on shore. Illegal sand exploiters here were extremely violent and willing to fight the authorities, Captain Nguyễn Minh Tuấn affirmed. Pointing to a big-sized sand mining boat on river, Tuấn said, they were ready to sink the boat and machinery worth VNĐ700-800 million when authorities tried to stop them. He also said that many sand mining workers were Khmer residents from western provinces who came to the city to work for meagre wages. It was difficult for the police to deal with them because they had neither identification cards nor temporary registration. Sand traders were devious to employ such workers, he added. Additionally, sand traders also avoided the police force by having locals planted at different spots along the river to warn them of any police presence. In a recent crackdown that was carried out with co-ordination between different agencies, three illegal sand mining and transportation cases were busted. One boat was seized and dozens of workers were nabbed, Tuấn said, adding that some of them jumped down from the boats into the river to evade capture. Salvaging boats sunk deliberately by exploiters was another challenge, because the police force has to mobilise big-sized cranes, Tuấn said. He also said that existing fines and other punishments were not strong enough to deter the illegal sand miners. Lieutenant Colonel Nguyễn Sinh Thu, head of the Cát Lái police station, said making illegal sand mining a criminal offence would be a strong measure that could restrict the activity and improve the situation. State agencies should consider stricter licensing of waterway companies and projects because there were cases where these firms collaborated with the illegal sand miners, he said. Colonel Nguyễn Văn Cương, deputy head of Hà Nội Police’s waterway police office, said they seized 13 illegal sand mining boats operating on the Hồng ( Red) River in Thursday. These boats with a capacity of around 500 tonnes each, belong to the Quảng Tây Joint-stock Company (four), two local residents (two), and the rest by people yet to be identified. In 2015, Quảng Tây Joint-stock Company was granted licence for mineral exploitation on 20ha, controlled exploitation of one million cu.m over 10 years, by the Hà Nội People’s Committee. The licence mentioned clearly that company wasn’t allowed to use boats or ships to transport the sand (it had to be done by road). However, initial investigations revealed that the company had carried out exploitation out of the licensed area, and used four large-capacity boats specializing in dredging the river bed, and sold it to other traders.